Winemaker Mark Stupich work his first harvest at Kenwood Vineyards in 1975. In the beginning it was his summer job, working as a cellar rat shoveling grape skins out of tanks and falling in love with everything about the wine business. Knowing he’d found his passion at Kenwood, he almost gave up on his studies at Sonoma State University – but decided to finish his psychology degree after his mother broke into tears when he floated the idea of dropping out. He used his early Kenwood earnings to hike the Pacific Crest trail after graduation, making it from Mexico to Lake Tahoe before tossing his boots and heading back to Kenwood in time for crush. “It’s just so much fun making wine,” he says now, never having lost an ounce of the enthusiasm that’s fueled him since early on, carrying his career upward at the winery until he was made winemaker in 2006. 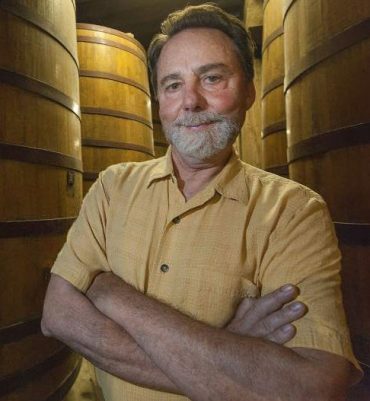 He started at Kenwood not long after the Pagani family sold vineyards and prune orchards to John Sheela and Mike and Marty Lee – and Kenwood Vineyards was born, in an old wooden barn with the leaky redwood tanks. The orchard was felled and Kenwood grew, including being the exclusive producer of Jack London Vineyard wines for the Sheppard family since 1976, where Stupich has taken part in every vintage. His lifelong favorite vintage is 1979 when they were shorthanded and he worked with three other guys from 6 a.m. to 10 p.m. day after day, going home only to sleep. “I was 26 and I was the oldest,” he says.